I'm back with the rest of the story. I was so happy to see that the little Eagle family did not leave when I went in the house. Luck was still with me or was it perfect timing. So after running inside to get my coat and hoping to get back to the ice before the Eagles flew away, I remembered that I had my 500mm lens in my car from the day before when I had gone to shoot the Snowy owls, which I never found. Now I was really pumped because I was going to be able to bring those eagles in so much closer. Well, they were closer alright, but they were not good. I knew the minute I looked through the viewfinder that I was in trouble. This guy above was so foggy and somewhat out of focus but I post him anyways to illustrate the error. I should have known better than to leave that lens in my car in below zero cold. The minute I switched off the 300mm and added the 500mm I was in trouble because I did not let the lens warm up. I just ran back to the lake. Lesson learned right there. All gear now comes in each night because thinking I was not going to need that lens on this day, I left it behind. All I can say is thank goodness for Lightroom and for the fact that the lens eventually warmed up. 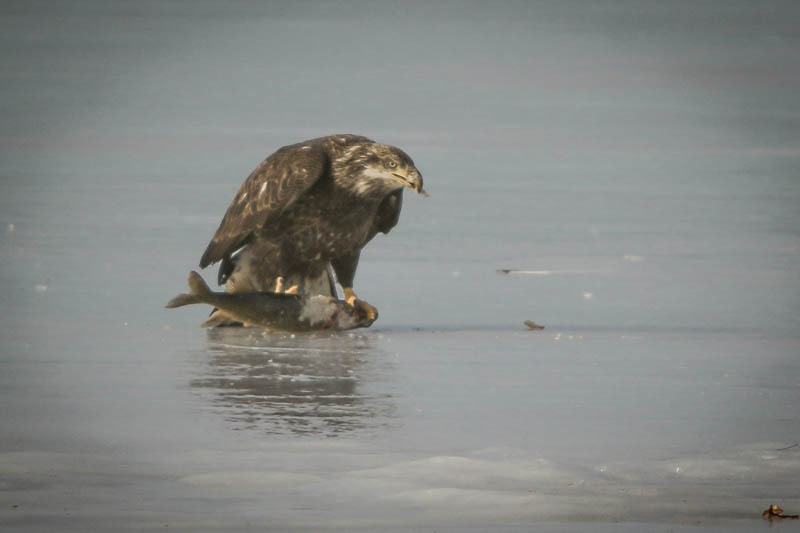 Take a look under the eagles' claws and see how much of that fish is left...but a surprise was on the way for me. Young Eagle with his own lunch. Yes, people, we have a family here. Who knew. I was pretty shocked by this when he slid onto the ice from above. I never saw him coming. He also has a nice fresh fish to share with the family...now let's see how that goes. Lesson two. I should have bumped up my ISO on these shots. Because of the distance between us and the sun going in and out, I could have used a bit of help here for clarity and sharpness. Still, I am happy just to have these shots. Now, to me, this guy is really scary looking. He has a look that says, don't even try to take my fish. You already had yours...we will learn what Mom and Dad have to say about that. I still can't believe how big these fish are. As you can see he's doing a good job here of taking this fish apart, bite by bite. He's not very neat either with a piece of that fish hanging out of his mouth. Every once in awhile he looks up to make sure his Mom or Dad is not approaching. He is not in any mood this morning to be sharing. Well, well, look what we have here. Mama Eagle with very little fish left between her claws. It does not take long for her to try to push her power over on her young one. Here comes Mama trying to get at baby's breakfast. Coming in for a landing but the baby isn't ready to give up easily. Did you ever try to take a cookie away from a toddler, well this was the same thing. I have to tell you it was the most amazing exchange I have ever seen or heard. Yes, eagles do squawk at each other and very loudly. I hung in there to see how this dispute was going to end. Mama eagle is back on the ground but the young one took off, dragging his fish with him..I sense a test of wills will pursue. Looks like Mom made her point and the young one flies away, leaving his lovely, half-chewed fish, laying on the ice. I have to say this was just so powerful to watch. When the eagles fly it is magnificent. The wingspread is amazing. It's a wonder that they can lift themselves off the ground and yet in flight, they are so graceful. I knew I was witnessing a slice of life that few get to see and I tried to stay with that thought and just be in this wonderful moment of joy. This is my favorite shot from this series. 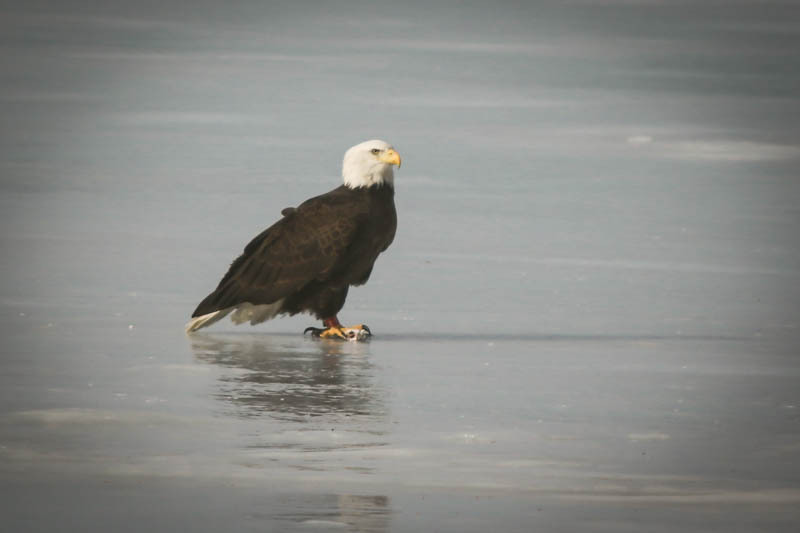 At the end of the day, with just a tiny piece of that fish laying on the ice, both eagles spread their wings, turned and were facing me. It almost seemed like they were bowing to me in their own way. Mother and baby together, performing a dance of elegance against the frozen lake. Almost immediately after this dip to the fish and hopefully to me...they flew apart and went their separate ways. The mother flying off into the woods and finally landing on a tree not to far from my house and the young one was heading over to the fishing shacks on the ice. Perhaps that is where they were getting their dinner. I'm thinking maybe the men fishing were tossing a few to the Eagles. I guess I won't know until I get back up there to our house. I'm not expecting though, that I will ever have a chance like this again. Then life is strange because I never thought I would ever witness this kind of beauty at all. By the way, the mother Eagle did take the fish away from the baby Eagle but like all mothers, I'm sure she waited until he had had his fill. Such an amazing hour with this Eagle family. I have had the pleasure of photographing an Eagle family before when we were at Mount Kartardin but it did not even begin to compare to this. So lesson number 3. Be ready. If all the stars line up and you are without your gear...you will remember it always but not with a lightness in your heart of having seen and captured something so beautiful, that even on a freezing cold day, it would warm your heart. Finally, I know as photographers we all want that one great photo every time we go out. We work at it, study for it, have the equipment that will help us achieve that fantastic high of getting that amazing shot. I want that also. I learned perhaps the most important lesson for me when I got home and loaded these shots on my computer. At first, a feeling of great disappointment that they were not all tack sharp, in some, the detail was missing and the light was just not there part of the time. Then I got to thinking about how much joy and pleasure I got just being in nature in this most wonderful way. I thought about how I felt out there and each time I clicked the shutter I was creating a moment in time. Now, after editing and seeing them, they are good enough. They are good enough to bring back that day, those amazing raptors and a feeling of time well spent. I know it was a gift. Now, I know it's what photography is all about for me. Maybe the next time I go out I'll get that one great shot, but then again, maybe I'll just get a chance to capture another beautiful moment in time. All photo's in this second series were taken with the Canon 7D Mk11, my workhorse in nature ad the Sigma 150-500mm lens.